L Cárcamo-Ulloa, D Calva Rosales, N Ronquillo Rodríguez, F Nesbet Montecinos (2017): “Mexico in the Chilean press: analysis based on mining of textual dates in Twitter”. Revista Latina de Comunicación Social, 72, pp. 897 to 914. 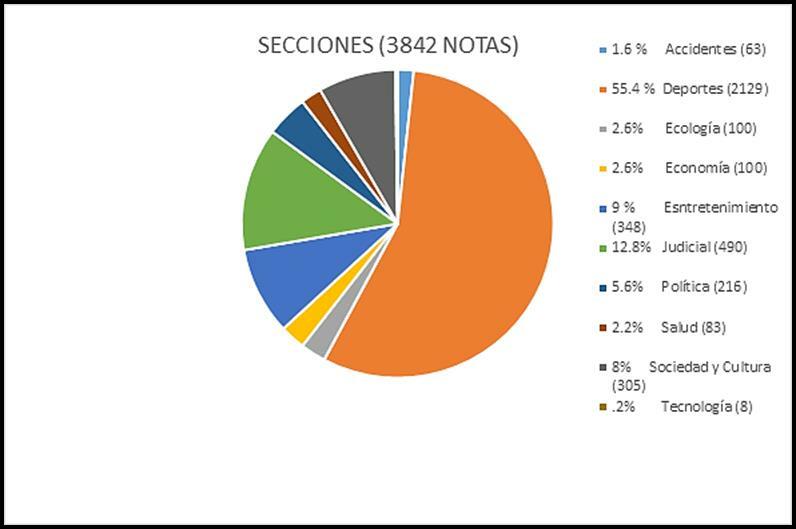 The present article researches 3.842 mentions about Mexico and the Mexican people in the Chilean press (290 medias), based on their headlines on the period comprised from 15th March to 15th June of 2016. The collection of dates had extracted from the accounts of the medias in the network Twitter. The general purpose of this investigation is describing how much the Chilean press speaks about Mexico and which are the most recurring issues, thus the impact that can generated in the construction of the intercultural image. For this work was used a methodology based on mining of dates, starting of a crawler (automatic software that collects in a systematic way textual dates), that follows of Chilean medias and accumulates its headlines in a server. Later, with the support of tools such as Elasticsearch and Kibana, it could explore the textual dates contents in the base of dates. Subsequently to the mining it classifies the headlines in 10 informative fronts. Among the conclusions it can note that exists a strong association of Mexico with the sports events, problem of drug trafficking, violence and events starring by artist. Keywords: informative treatment, news, mining of dates, Mexico, Chile. Contents: 1. Introduction. 2. Relevance of the image that the press gives of the another. 3. Some researches about “the another” in Mexico and Chile. 4. Methodological Approximation: mining of dates, social networks and information. 5. Materials and proceedings. 5.1. The analyse period and the base of dates. 5.2. The purpose of the investigation. 5.3. Strategies of analysis. 6. Results. 6.1. General Panorama: Mexico on the Chilean press. 6.2 Thematic Classification and coverage of news. 6.3. The connexion that links two nations: the football. 6.4. The node of fear: judicial issues and events. 6.5. The hits of the stars: the entertainment. 7. Conclusions. 7.1. Limitations and projections. This investigation parts from the premise that the media collaborates, based on emitted information, on the construction of public opinion. For example, Sánchez and Lobos (2011) and Van Dijk (2006) emphasize the weight that symbolic elites (politicians, journalists and professors) have in the installation of racism in ideologies. In such a way, the information reinforces the prejudices and generalizations about the citizens of other countries, many times as an effect of globalization, without mediating geographical or cultural proximity. We chose the case of Mexico as, from a Chilean standpoint, it is quite a neutral study subject. The Aztec nation is the largest Spanish speaking country in the world, and the second largest in Ibero-America  after Brazil. Regardless of the fact that Chile and Mexico share historic and cultural links, they do not share a border, which provides a more neutral aspect. Another influential factor is the inexistence of a numerically significant amount of Mexican residents in Chile, or of Chileans in the Aztec country. To compare, between 2005 and 2014, 2,300 Mexican citizens arrived to Chile; while in the last five years around 19 thousand Colombians, 15 thousand Argentinians and six thousand Ecuadorians arrived. Even the amount of Spanish citizens has been higher (La Tercera, 2015). The Chilean population in Mexico is around 5,300 people, which is in agreement with official collective data (Rodriguez & Cobo, 2012) . As a consequence, the relationship between Mexico and the Chilean media implies that data processing should have a certain neutrality and amplitude that is probably quite difficult to find in the information about neighboring countries and/or countries with open geopolitical conflicts. However, developing an investigation among the hyper abundance of information that exists in cyberspace, which increases every day, can include enormous complications. In this context, data mining is an area of investigation that leads to inter- and multidisciplinary studies. This is due to the fact that with the extraction and processing of data found freely in the web, we can explore and understand extremely varied phenomenons such as geo-positioning, technology-mediated learning, social behaviors and the way journalists treat the information. It is precisely in this last area that we will work to review how the Chilean press treats information related to Mexico, to categorize the most reoccurring themes, to quantify the amount of appearances and to observe informational cycles. The press, from its start until present day, has been constituted as an instrument of societal projection. It exposes speech that is manifested as “reality” from different scenarios, for the reflection and construction of public opinion. The media selects the news that they deem relevant for the general population. It construes standards and guidelines, also known as agenda settings (McCombs & Shaw, 1972, & Zuluaga & Romo, 2015). On a socio-cognitive level we can contemplate that the media provides to its users something to think about and that, if it is not a deciding factor in the judgments or reflexive and complex processing of the average individual, that it at least lays the foundation for thought construction. -Selection Bias: this occurs when a media source selects a news topic over another. -Statement Bias: this happens when the media makes comments in favor of or against a specific person or determined situation. In summary, a continuous exercise of symbolic violence (Bourdieu & Passeron, 1998), in which the dominate elites use their persuasive capacity until achieving that their idea is assumed as truthful and that the subjects deliberately adhere to the planted concepts. In the Intercultural studies field of Browne, Silva & Baessolo (2010), they emphasize how the information that the media provides about “the others” generates a global stereotypical image and provokes attitudes that are judgmental and potentially lead to discrimination. The importance of the media does not only consist of the influential power that it possesses, but in how they utilize speech to refer to “the other”. Today, with the majority of mediums on social media, the press broadcasts have a larger informative range, reaching public juveniles that are not “traditional” consumers of written press. Besides this, news does not only run from the media broadcasters to the followers, but, when it is accepted and of public interest, it generates a contagious process, or a snow ball effect, that “seems more like a mouth to mouth transmission” (Cárcamo & Sáez, 2013, p. 5). In this context, many times the information has a larger value by being shared from someone who has a social media link. Press studies about “the other” is no new thing. Different traditional investigation areas- like social communications, linguistics, anthropology or social psychology- have made jobs that analyze informative media as other complex communicative interactional phenomenons. Along with the construction of “the other” in the media, completed investigations in Chile by Browne, Silva, & Baessolo, R. (2010) and Browne, Del Valle, Silva, Carvajal, & Inzulza (2011) are worth mentioning. The first study responds to an analysis about the representations of Peruvians and Bolivians in the Chilean press, and how these representations create and project images, stereotypes and attitudes towards each of the two nations. The second article plants a theoretical and methodological proposal to carry out a critical and complex analysis of the discourses (ACCD in Spanish) broadcasted by the Chilean and Peruvian press. Publications focusing on popular sectors in the newspapers La Cuarta (Chile) and Ajá (Peru) were used in the case study. Along these lines, it is also worth mentioning the investigation done by Alberto Mayorga and Carla León (2007) regarding the two most influential Chilean newspapers, La Tercera and El Mercurio and their treatment of the maritime conflict endured between Chile and Peru. Obviously in Mexico many studies have also been done regarding the image the foreign press projects about Mexico itself. Of course, in this line of work much relevance is given to the United States press, given Mexico’s special relations with the primary world power. Jorge Salgado (2009) reviews the related investigations from the 1980s, in which jobs existed to analyze the editorial lines of some United States media sources and the views regarding the Free Trade Agreement, signed in 1992, between the two countries. The agreement had deep political and economic repercussions for both countries. Along these same lines, a classic investigation was the one done by Juan Carlos Lozano (1988) about the images of Mexico in the Newsweek and Time magazines between 1980 and 1986. Also worth mentioning is the presentation of the Mexican image in the Spanish press, which was presented by José Ramón Santillán (2014). For this article the point of the analysis is to describe the construction of the Mexican image, based on the Chilean news broadcasts. We want to know how the Chilean media is handling information about the Mexican nation, what the relevant topics that define the Mexican scenario are and how important Mexico is for the Chilean press. Finally, we want to reflect about what role the media should have in regards to intercultural contexts. Media today uses social media as a duplicate channel for their informative forces and Twitter in particular is used on a daily basis for newspapers, radios and TV channels. Normally all the user activity online is registered in the web’s data base servers. In social media, the media participates using accounts with similar technical conditions and, while there is a reduced amount of public recipients online than in the traditional paper or television versions, the desire to consume information is just as present. In this context, the science of internet data or data mining appears so that all the useful information produced by users can be extracted and comprehended. The tools of data mining analyze this huge amount of information and converts it into knowledge. “Data mining is, essentially, a process driven by a problem: the answer to a question or the solution to a problem being searched for by analyzing available data. The analysis forms a nucleus in the data mining, but the complete process also embarks topics such as the definition of the management problem and the development of the solution to resolve it” (González, 2007, p.1). In this sense, the objective of data mining is to take advantage of the hyper abundance of information. It is for this reason that the work of this technicality is very relevant to establish concrete search terms, given that in an ocean of information it is easy to divert the meaning and lose sight of the initial objective. The present piece is quantitative. It deals with the supported exploration in press data mining, based solely on Twitter, and uses an exhaustive analysis of a specific time period. We propose that which Baeza-Yates (2009) calls content mining and in this case particular deals with textual data. 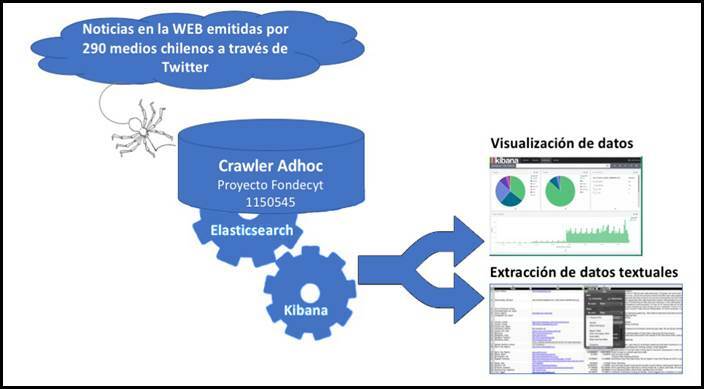 The mining process was done through an ad hoc  Crawler, installed in an informative server that follows minute by minute all the information emitted by 290 Chilean press Twitter accounts. The sample includes traditional and alternative forms of media, television, radio and written press. These forms fulfill two conditions: a) they have a Twitter account and b) they emit information at least once a week. For better methodological transparency we classify, according to López-García, Negreira-Rey, & Rodríguez-Vásquez (2016), the media into three groups: National, Local and Hyper local. The investigations final results, that cover a collection of news between March 15th and June 15th of the year 2016, have contributed to establishing a general panorama about how frequently Mexico and Mexican citizens are discussed in Chilean press and in what context they are mentioned. The Crawler collected 726,621 emitted news pieces from 290 different Chilean media Twitter accounts in that specific time period. From the collected body of news, the titles that mentioned the words “Mexico, México, Mexicano, Mexicanos, Mexicana, Mexicanas, Mejicana and CDMX” were selected. The final exhausted collection of news emissions contained 3,842 titles. It should be mentioned that other possibilities of mentioning the country were explored by using the letter “J” instead of “X”, but no occurrences were found aside from the term “mejicana”. Besides this, we noticed that the initials CDMX,  which are commonly used in Mexican media, were used on 23 occasions in Chilean media. Statistical-descriptive analysis assisted by web technology: Using data visualization obtained through ElasticSearch and Kibana (applications associated with the project’s Crawler) two types of visuals were obtained: a) histograms that notice the temporary evolution of vocabulary in the body of analysis and b) composed graphs that identify which forms of media and what percentage uses the searched words. Content analysis measured by arbitrary judges: Two expert judges, journalists and Communication Master’s students classified the titles into ten thematic categories: Accidents, Sports, Ecology, Economy, Entertainment, Judicial, Politics, Health, Society and Technology. They followed the established classifications by Vernier, Cárcamo and Scheihing (2016) as a model. In addition, inside each category they identified reoccurring themes in each subgroup. They also took into account and expressed in visual pieces these judges’ results. Figure #1 shows the massive data extraction process used for the present investigation. The compilation of Elasticsearch  + Kibana  is an ideal tool for the amount of logs, analysis and massive data visualization mined from the Internet. The tools used allow for an exhaustive and computerized work that would be very difficult to do manually. Reviewing 726,621 titles in 290 press sources to put together a collection would be an enormous task. The amount of statistical results derived from the investigative process is extensive. Because of this, we present what we consider to be the most relevant to address our investigation objectives. First, we will analyze the news representation regarding Mexico and/or Mexicans in the Chilean titles and we will compare these volumes with those of other Ibero-American countries. Second, we will address the macro subjects and their representations throughout the whole collection. Finally, we hope to illustrate, using specific topics determined by the news, the macro subjects that are represented the most in the collection. The 3,842 mentions about Mexico or Mexicans represent 0.5% of the total news stored by the Crawler. This percentage seems low, but it is interesting to note that the same exercise done about Bolivia and Bolivians resulted in 0.6% of the total. This percentage is barely larger than that of Mexico, even though Bolivia not only shares Chile’s northern border but an ongoing border contention between the two nations. Table #2 compares the amount of appearances regarding other countries and their people by doing the same search exercise. Evidently, the use of the country’s own name and its people is not the only way the press can refer to the citizens of the Mexican nation. For example, during the same time period, the name of the Mexican president, Enrique Peña Nieto, was mentioned eight times. The leader of the Cartel de Sinaloa (the main drug trafficking organization in the world), “Chapo Guzmán” was mentioned 118 times. In these cases their nationality was never in the press titles. Table #2: Comparative casuistry between 9 Ibero-American countries. On global terms, Mexico was mentioned on Chilean news Twitter accounts up to an average of 20 times per day. However, this distribution is not impartial, as Graph #1 shows, an explosion of mentions occurred at the end of the studied time period. It is possible to observe that a constant frequency is maintained in the amount of mentions, however, in the month of June a considerable amount of activity was annotated. The increase occurred during June 1st with 458 mentions, June 5th with 241 mentions, June 9th with 196 mentions and June 13th with 220 mentions. The motive behind this was the friendly game between Chile and Mexico in San Diego, United States as a part of the Centenary Cup. During this time period, all activity was precisely followed before, during and after the event, totaling 1,246 mentions in only four days (see Graph #2). It is important to emphasize that much of the information analyzed was repeated information and that some media outlets copied the news of others. Likewise, we noticed that during the event some accounts were mentioning almost every minute about what was happening on the playing field. Table #3 demonstrates that the media on a national coverage level is what principally talks about Mexico and Mexicans at 87%. Regional coverage follows with 11%, and hyper local coverage represents only 1% of all mentions. Another general observation is that of the 290 mediums followed by the Crawler, 139 mention Mexico or Mexicans in one way or another in their titles. With regards to the media that most talked about Mexico, it was detected that 142 Chilean media Twitter accounts talked at least once about the country in the analyzed period. Of these, 20 talked regularly and more than 50 times in six months. Some of these connect with international networks, which is why it is inferred that the coverage of these Mexican releases is due to the global reach of these mediums. It is interesting to mention that among these mediums, there were some that were dedicated to sports, which reinforces what was previously mentioned about the importance of the topic. However, written medium registries were not the only ones found. Other mediums that continually mention the Aztec country are broadcasters, like Chilean television groups. The following graph shows the distribution of the media that has spoken most about Mexico. Graph #3 shows that seven mediums are responsible for 50% of the coverage, while the other 13 mediums complete the other 50%. The graph shows a low concentration, given that there is not one specific medium that concentrates on a large amount of information. In the titles there is a fair distribution, in which traditional, written Chilean mediums participate. For example, El Mercurio On Line: 8%, radio stations like Cooperativa: 9%, and television stations like 24 hrs TVN (Chilean National Television News Channel): 7%. The weight of the sports related press is also evident as El Gráfico Chile: 9%, As Chile: 5%, Emol Deportes (Sports): 3% and Bio Bio Deportes (Sports): 4%. The news was classified by thematic areas, following the proposal by Cárcamo, Vernier & Scheihing (2016), in which there are ten categories: Accidents, Sports, Ecology, Economy, Entertainment, Judicial, Political, Health, Society and Technology. 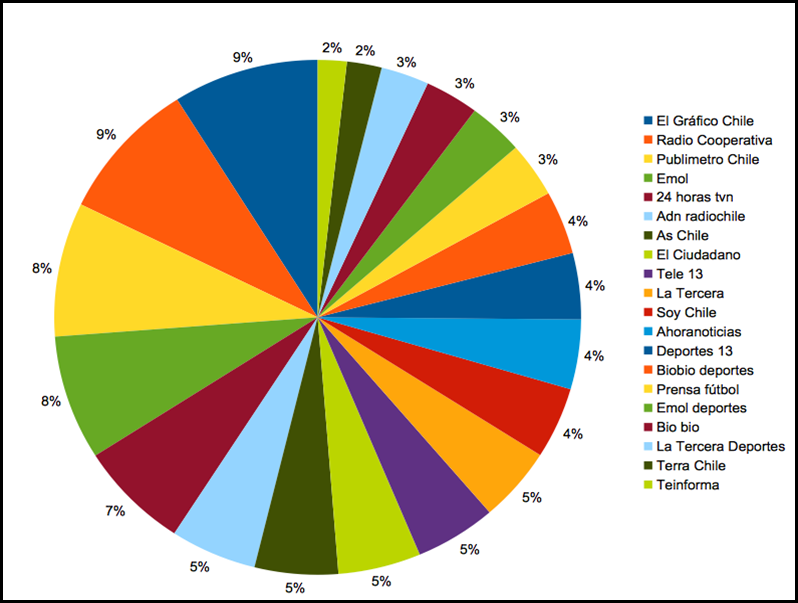 The presented distribution in Graph #4 is useful for identifying the topics of interest addressed by the Chilean media on Twitter. The largest amount of coverage related to Sports” with 2,129 releases, which represents 55.4% of the total news mentions. Following this, “Judicial” had 490 releases, equaling 12.8%. The remaining releases participated in less than 10%. “Technology” resulted the least influential, having 8 mentions. 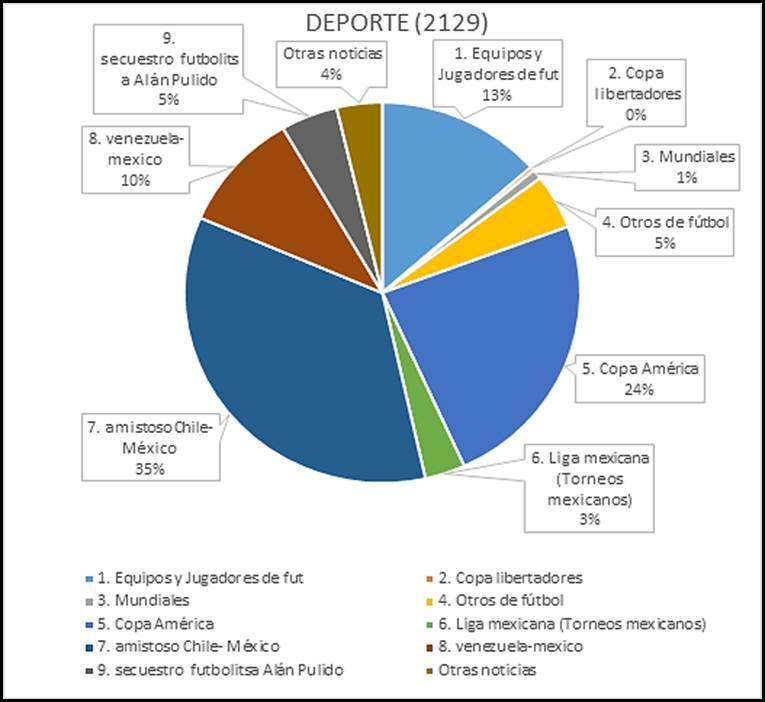 In summary, the graph permits us to observe that Sports (55.4%), Judicial (12.8%) and Entertainment (9%) are the principal macro subjects in which the Chilean press mentions Mexico. As a second step, the principal topics were analyzed by category. It is unnecessary to explain the immense interest that the contemporary western society has towards football (with exceptions like the United States, Canada, Venezuela and Cuba; even though interest in football has been increasing in these countries as well). This interest explains the correlation in the ample media attention given to this discipline and explains why it is not out of the ordinary that the “Sports” macro subject is practically full of football related events (for example: “Mexico classifies in the quarter-finals after defeat over Jamaica and is only steps away from Uruguay”. Agricultura FM, June, 2016). Only 79 releases (a corresponding 4%) alluded to other disciplines like boxing, basketball, cycling, among others (for example: “Mexican runner would have died of hypothermia during extreme test”, La Prensa Austral, April, 2016). In this context, the main coverage was regarding the friendly game between Mexico and Chile on the 1st of June in 2016, which also had follow up releases in the succeeding days. Another topic that derived high media participation, which is closely related with the first, was the American Cup and its related events and activity. Both topics accounted for 77% of the total mentions (see Graph #5). 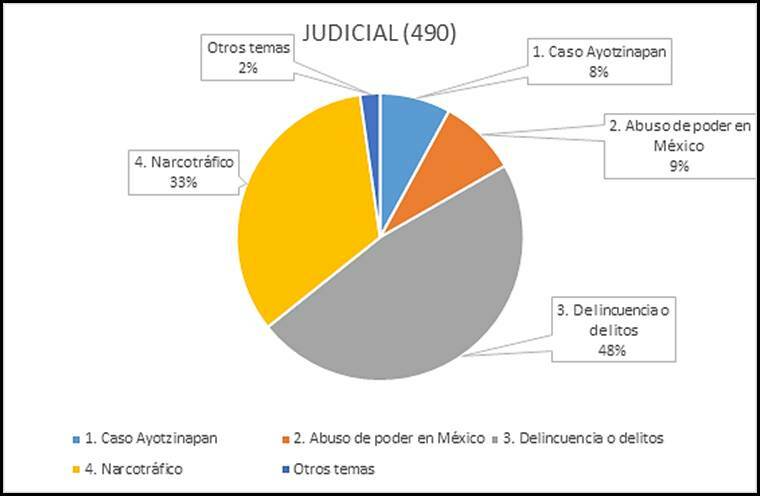 Regarding the macro subject “Judicial” and related events (Graph #6), the majority of the news coverage corresponded to delinquency and crime, with 233 releases equaling 48% of total mentions, (for example: “Five people murdered and burned with Molotov bombs on Mexico” Emol, April, 2016). Following this was drug-trafficking with 164 releases that equal 33% of total mentions, (for example: “Largest drug tunnel in history discovered between United States and Mexico” MQLTV, April, 2016). To be clear, the majority of incident related news releases are linked with violence, internal repression and drug-trafficking. Mexico, being the largest Hispanic nation in the world, has the main cultural industry in Ibero-America, with one of the largest television channels in the world (Televisa) . Because of this, various Mexican musicians have achieved great fame throughout the whole continent. Also, it is not to be forgotten that the musical style Ranchera is incredibly popular in the rural sectors of Chile. Therefore, almost every year at the annual Festival de Viña del Mar musical show, a Mexican artist is present. The Chilean musical contest, famous throughout all of South America, has historically been a launch pad on this side of the world for many Aztec artists. 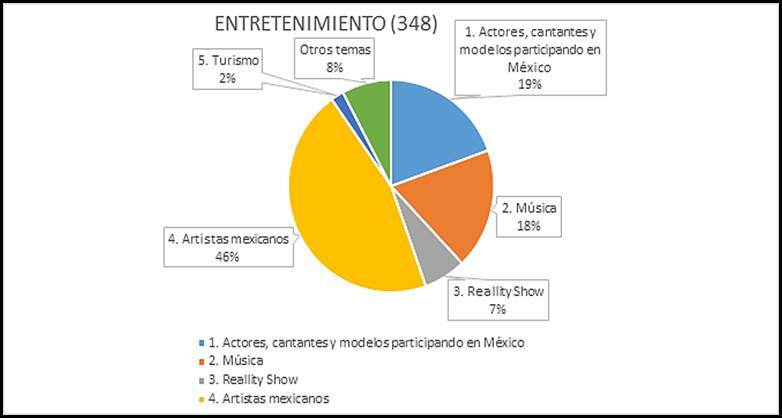 It is due to this that in the macro subject of Entertainment (Graph #7) a lot of news that was found was related specifically to the participation of Mexican artists (for example: “Mexican press ensures that Luis Miguel is missing the audition” Emol, March, 2016). In total, 159 releases, or 46% of the total collection, were found. The releases about international actors, singers and models that visited Mexico followed with 19%, (for example: “Jessica Simpson conquers the excess weight and reappears in Mexico with dazzling figure” Página 7 Chile, April, 2016). On global terms, the amount of news titles that talked directly about Mexico were proportionally low: 3842 releases equaling 0.6% of the total emissions by the 290 followed mediums. This is an average amount when comparing the mentions made about other Ibero-American countries (see Table #1). It is also important to mention that the large, national-level mediums are the ones mentioning Mexico and Mexicans. The closer mediums, or the hyper locals, do not participate to a significant amount in the searched and analyzed mentions in this investigation. The amount is barely 1% (Table #3). In good measure this is a logical conclusion, as this group of media focuses their agenda more on their own geographical territories. Evidently, in our case study the number of news releases would have been less if the time period analyzed had not included an important football match between Chile and Mexico. This allows for further reflection about the constant weight and impact that football has on the Chilean culture; not only when there is a specific match or competition involved. While categorizing the news that talks about Mexico and/or Mexicans we learned that the three most relevant macro subjects are Sports (in which football has a superiority of 96%), Judicial and Entertainment. Said categories total 77.2% of the informative pie. Analyzing these sums brings up how little Chilean media talks about Mexican Society and Culture, Economy, Ecology and Politics. A good example of this is the search done using the term UNAM, initials of the National Autonomous University of Mexico, also known as one of the most important academic centers in Ibero-America. This house of study only had 10 mentions: 4 were related to their football team and 6 titles were related to academic topics. As an exploratory exercise, and to see if the reasoning for the lack of societal and cultural coverage was due to the time restriction of our specific investigation, we looked for mentions of relevant and current people from the Mexican culture. We searched Juan Villoro and Héctor Aguilar Camín, two known figures in Hispanic literature, and Gabriel Orozco, who is perhaps the most known Ibero-American painter. In order to find mentions about these intellectuals it is necessary to scale the search back to a whole year, and even then the results are residual. Villoro is mentioned 6 times, Aguilar Camín, twice, and painter Gabriel Orozco is not mentioned. This makes us ponder how the press collaborates to construct an image of others according to information that has little to do with the cultural values of a nation. After everything, we can conclude that the Chilean press on Twitter constructs an agenda of biased information about Mexicans and their culture. Evidently, this contributes to the formation of a partial image of “the other” based on the overexposure of one-time events and the constant repetition of the macro subjects. It is important to emphasize that this news is in many cases the only approach to the Mexican context and that its assimilation can be reflected in different behaviors present in the interactions. Therefore, we emphasize the responsibility that the media has about what and how they refer to different global scenarios. The study is limited to the analysis of news titles directly referring to Mexico. While this permits a direct and exhaustive focus from textual data mining, obviously any residual mentions that could have been made in news texts or reports about Mexico would not be included if the titles themselves did not include the words “Mexico” or “Mexicans”. As far as future projections, it would be interesting to continue with comparative investigations following a group of Mexican mediums or to compare if how the Chilean press treats other Ibero-American nations is similar to the results of this investigation. Another interesting possibility would be if a group of Mexican mediums does an equal analysis about Chile and Chileans. All these are real possibilities today thanks to the textual data mining strategies, the web and social media. The present article is based on contributions from the Consejo Nacional de Ciencia y Tecnología (Conacyt – Mexico) and the Comisión Nacional de Ciencia y Tecnología (Conicyt – Chile). The Chilean organization La Comisión Nacional de Ciencia y Tecnología de Chile financed the project from the Fondo Nacional del Desarrollo Científico y Tecnológico (Fondecyt # 1150545), titled: “Social Media and the Media: Model of Analysis Based on Data Mining for the Understanding of the Informative Chilean Ecosystem on the Internet and Online Communicational Education”. Said investigation, led by Dr. Luis Cárcamo and assisted by Mg. Felipe Nesbet, who contributed the technology used for data collection, analysis and visuals worked with in this project. For their part, the Mexican Conacyt awarded academic foreign-exchange scholarships to the Postgraduate students Delia Calva and Nayeli Ronquillo at the Austral University of Chile, who compiled the data to analyze Mexico from the Chilean press. P Bourdieu y J Passeron (1998): La reproducción: elementos para una teoría de la enseñanza. México: Fontamara. R Browne, C Del Valle, V Silva, J Carvajal y A Inzulza (2011): “Propuesta teórico-metodológica para un análisis crítico y complejo del discurso (ACCD) en la prensa de Chile y Perú. El ejemplo de La Cuarta y Ajá”. Estudios sobre el Mensaje Periodístico, 17. X López-García, MC Negreira-Rey y AI Rodríguez-Vásquez (2016): “Cibermedios hiperlocales ibéricos: El nacimiento de una nueva red de proximidad. Cuadernos de información, 39. Chile: Pontificia Universidad Católica de Chile, páginas 225 a 240. E Pariser (2011): The filter bubble: What the Internet is hiding from you. Gran Bretaña: Penguin. L Sánchez y L Lobo (2011): “Zara: Valentía civil contra el racismo. Una ONG que postula la conciencia social frente la discriminación en Austria”. En C Hernández: Racismo y educación. De la invisibilidad a la evidencia. España: Editorial Complutense. T Van Dijk (2009): Discurso y poder. España: Gedisa. M Vernier, L Cárcamo-Ulloa y E Scheihing (2016): Diagnóstico de la estrategia editorial de medios informativos chilenos en Twitter mediante un clasificador de noticias automatizado. Austral Ciencias Sociales, 30. Chile: Universidad Austral, páginas 183 a 201, recuperado de http://mingaonline.uach.cl/pdf/racs/n30/art09.pdf ISSN: 0718-1795. (Fondecyt # 1150545), titled: “Social Media and the Media: Model of Analysis Based on Data Mining for the Understanding of the Informative Chilean Ecosystem on the Internet and Online Communicational Education”. Said investigation, led by Dr. Luis Cárcamo and assisted by Mg. Felipe Nesbet, who contributed the technology used for data collection, analysis and visuals worked with in this project. For their part, the Mexican Conacyt awarded academic foreign-exchange scholarships to the Postgraduate students Delia Calva and Nayeli Ronquillo at the Austral University of Chile, who compiled the data to analyze Mexico from the Chilean press. Using the planted terminology of Alain Rouquie, the term Latin America generally does not include the French-speaking populations in the United States, Canada and the Caribbean. Therefore this project opted to use the term Ibero-America, as it is more precise in referring to the Hispanic and Lusophone communities. While in 2014 the most recent border conflict with Peru was put to rest, Chile currently has a disagreement with Bolivia in the International Courts of La Haya. We focused on the studies by Browne, Silva & Baesollo (2010) and Browne, Del Valle, Silva, Carvajal & Inzunza (2011), that transmit and connect the traditional media related information from Chile, Peru and Bolivia. During the Chilean Military Dictatorship (1973 – 1990), thousands of political exiles took refuge in the Aztecan country, led by Ortensia Bussi, the widow of President Salvador Allende. This community contributed greatly to the cultural development in Mexico. Since data mining operates on an enormous scale, the analogy of mining is followed. This is why terminology like “extraction”, “mining” and “deposits” are used. This abbreviation, which refers to Mexico City, is related to the political reform of 2016 that changed the previously known Federal District to a new federative entity of the Mexican Republic. There have been many Chilean artists that have radiated through Mexico in order to internationalize their careers. Beginning with the “Angeles Negros” in the 70s, followed by the rock groups “La Ley” and “Los Bunkers”; during the elaboration of this study the Chilean singer Mon Laferte was growing in her popularity in Mexico. It is also worth mentioning the television entertainer Rafael Araneda. Also, write Roberto Bolaño developed his career in the Aztec nation. The exception to this was Frida Kahlo, who had 12 mentions, due to the record one of her paintings broke at an auction, which beat out Mexican Diego Rivera. Article received on 24 May 2017. Accepted on 26 July. Published on 31 July 2017.